For those of you who grew up in India in the 80s and 90s, I dont have to try hard to revive memories of this exquisite ice cream. This was a time when a plethora of different flavours of ice cream was not yet available in the Indian markets and since the economy was not yet liberalized, there was no chance of savouring the taste of the many foreign brands of ice cream that are now available. To me, kulfi meant summer holidays, playing in the garden and taking a walk alongside the lush green fields in my paternal hometown only to get back and relish this marvel with my cousins. I still remember how I had to face my cousins ire when I interrupted an intense game of cricket saying the kulfi that my aunt was making was ready, only for them to be back and discover that the moulds had just gone into the freezer and they had to wait a few more hours to enjoy it. Cut to the present, when I looked for kulfi in the many hotels and stores, I was met with extreme disappointment with the watery and overtly sweet hard pieces of rock like ice cream that were being passed off as kulfi. It was nothing reminiscent of the soft, creamy wonder which was delicately spiced and moderately sweetened (so that it doesnt overpower the subtle aromas of the spices) that I remembered growing up with. It was further dejection when the kulfi served in the best Indian restaurant in town did not have the taste nor the flavours of yore. So, when I had a group of friends over to watch Hari’s birthday video, I decided to treat them with this marvel. And it was just right for the searing Mumbai heat and humidity! 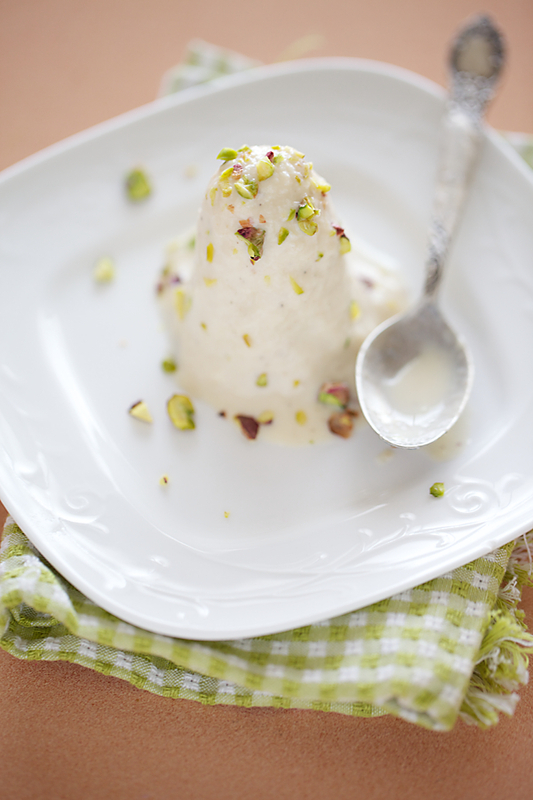 I resorted to an old recipe which was tried and tested and had tasted marvelous when I had made “kulfi” years ago. 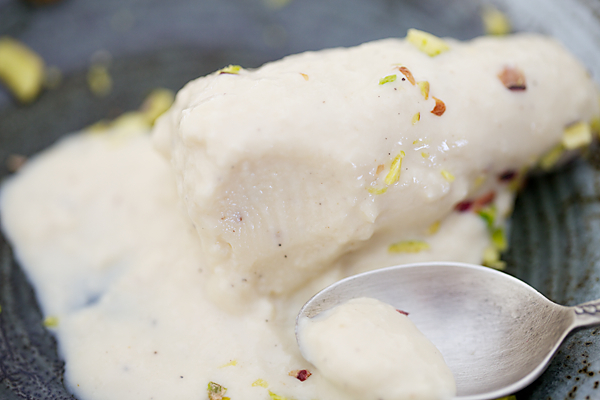 The secret to making good kulfi is using good quality ingredients and the right amount of caramelization of milk. 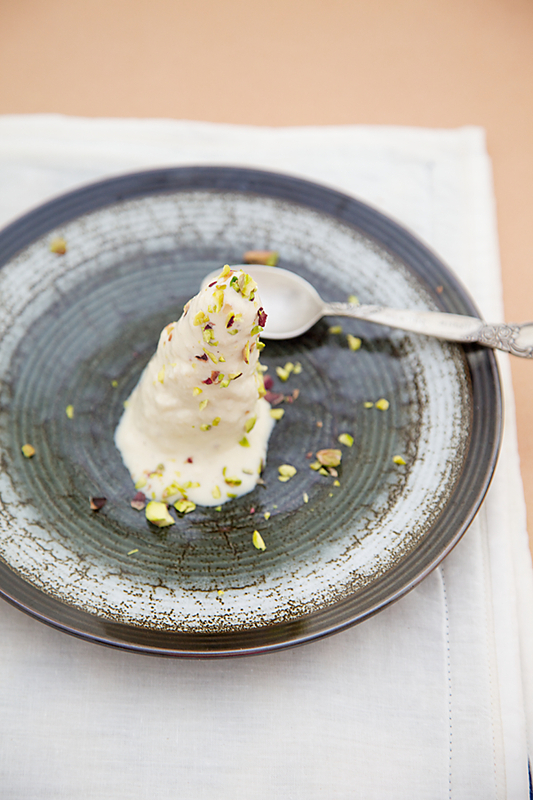 This kulfi is soft and creamy with just the right amount of sweetness to it. The cardamom and nutmeg add exotic highlights and the finely chopped pistachios add colour and texture while balancing the flavours (kids might like it without the nuts though). My friends enjoyed the kulfi and as expected so did my husband! But, what came as a surprise was my little Hari! The way he relished it made all my efforts of my midnight kulfi mixture seem worthwhile. In a heavy bottomed pot or pan, mix in the milk, condensed milk and milk powder and cook on medium heat until the milk comes to a rolling boil, about 15 minutes. Once the milk comes to a boil cook on low heat for about 25 to 30 minutes, stirring in between to prevent sticking, until the mixture thickens and caramelizes and gets that lovely kulfi flavour. 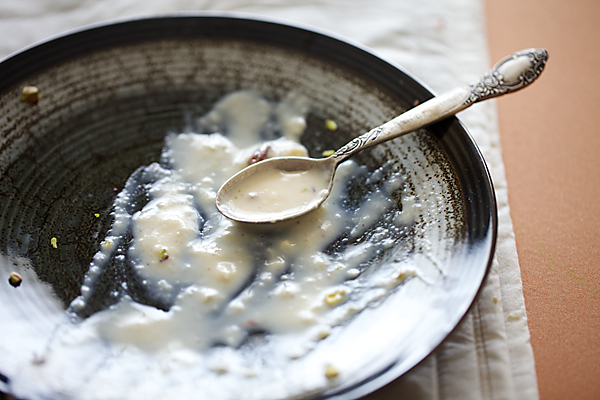 In a small bowl pour a ladle of the mixture and mix in the cardamom and nutmeg and make a smooth paste. Sir in the paste into the kulfi mixture. If used directly the cardamom forms lumps which makes it difficult to disintegrate into a homogenous mixture. 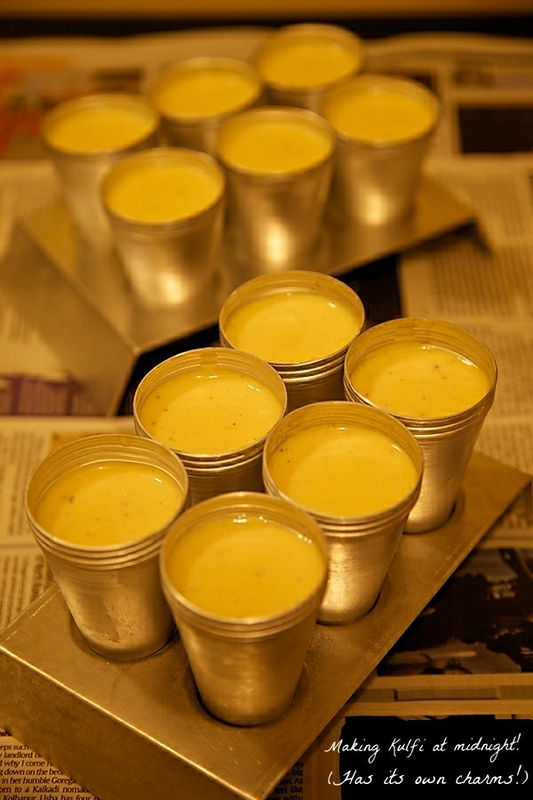 Allow to cool and pour into kulfi moulds. If you do not have kulfi moulds, pour into shot glasses and when the mixture is half frozen, about 30 minutes, insert a stick into it. Chill overnight or for 6 to 8 hours. This quantity gave me 12 medium sized kulfis and 5 small ones with little bowls. How delicious Anu..and so good that Hari liked it..I had to make it with chocolates to get my kids eat this..:)..pictures are tempting..
Anu, Can't resist a home made kulfi! Those (aluminium?) kulfi moulds are really adorable. May I ask where you bought them from? Dislike buying plastic moulds and those are the only ones that are generally found everywhere..
Btw you should try bowring kulfi @ Bangalore and they are the best with right taste and flavors.. Thanks for posting such wonderful recipes..
Also I must say that I have been preparing the sambar recipe you have posted and its become a hit in my family 🙂 Thanks a lot..
Luscious and droolworthy kulfi,none can resist to it. I remember my mother making mango kulfi during the summer holidays. Gone are those days. Your post brought back those memories 🙂 Lovely. Looks so delicious! Love the photos. Especially the pistachios on top..
As always a great recipe with super visual treat. Gonna try it out soon. One question, milk whitener (the ones we normally get in stores) & milk powder are same thing? I was looking for milk powder for quite some time in Bangalore but couldn't get it. Which brand milk powder are you using? hey.. what is the measurement of the condensed milk in cups? as cans can vary in measurement! Amazing collection of recipes! You might be interested to know how I came here! I was browsing my photostream on flickr today, and came across your comment on one of my photos clicked, 5 years ago. I could not recollect who you are and so I clicked on your profile and was happy to see that you are a food blogger! Have bookmarked your blog! Very Yummy recipe Anushruti. I just want to share my Kulfi experience which I tried couple of days back. Instead of heating milk I substituted it with evaporated milk and I used 1 can of each condensed milk, evaporated milk and added 1 cup heavy cream, elaichi powder and saffron strands. Next I run this mixture in the blender couple of seconds and pour it in a pan and freeze for 6-7 hrs. It came out very nicely and very yummy. Looks lovely Anu. Imagine cold kulfis in hot hot summers. Loved the rushes of green here and there!! Irresistible kulfi loving it very much.So damn good. 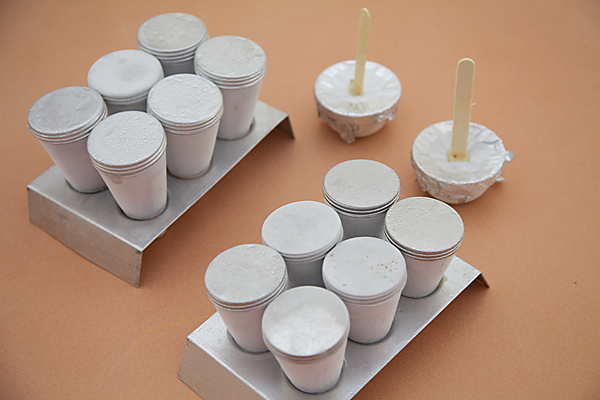 Radhika: My kulfi moulds are very old but I remember seeing aluminium kulfi moulds in Arife, Mumbai. Deepa: Thanks for the feedback. Will definitely check out bowring kulfi the next time I'm in Blore. Pallavi: Yes, they are one and the same. I like using Britannia but since the store was out of stock with it, I had to settle for Nestle. Anu: Condensed milk usually comes in 398/400 gm cans all around the world. You neednt worry about the cups here. Wow Mam, Like always great Pictures…. Really needed cool, cold and homemade kulfis in this summer…looks inviting.. Yummy!! This i absolutely love….must give it a try. Dr. Coelho: I'm so happy to hear from you! I hope your grandchildren love it! What volume of milk is left after those 35-40 minutes? I'm thinking of taking a shortcut and just using that amount of heavy cream (a farm in my area sells the most fabulous thick rich heavy cream I've ever had). hi,how to make kulfi in dry powder full creem material,i am facing ice problems in kulfi.sometime i put in corn flour,medda,but i faild. Paige: Sorry for the late response. Even if you use cream you will have to cook it. We are looking at a caramel like taste and texture here which is only acquired after cooking milk for a long time. Nami: Sorry for the delay in responding. Milk powder is easily available around the world. You shouldnt find a problem sourcing it of you look for it. Since condensed milk already has a lot of sugar in it, additional sugar is optional and go for it if you like your desserts very sweet. Hi Anu, Cooked milk, condense milk, milk powder on low heat for 40 minutes, but didn't thicken? Annie: That's very surprising. I hope you were not looking at a solid consistency. After thickening too, the mixture would still be liquid in consistency and will harden once frozen to a smooth and creamy kulfi. Anusree: Your words made my day! Thanks for your appreciation. I'm humbled by your kind words. I dont want to make alot of Kulfi. Can u give me the recipe for about 3-4 kulfis? as we are only afew family members. anita: You can halve the recipe or maybe make half of half? But, you will have to reduce the cooking time accordingly. When do you add the saffron? This came out perfect Anushruti! Thanks for the recipe. Ukesha: For an intense saffron flavour, you can add the saffron when the milk begins to boil. Anushruti, Thanks for this recipe, I will try this and let you know how this turned out. 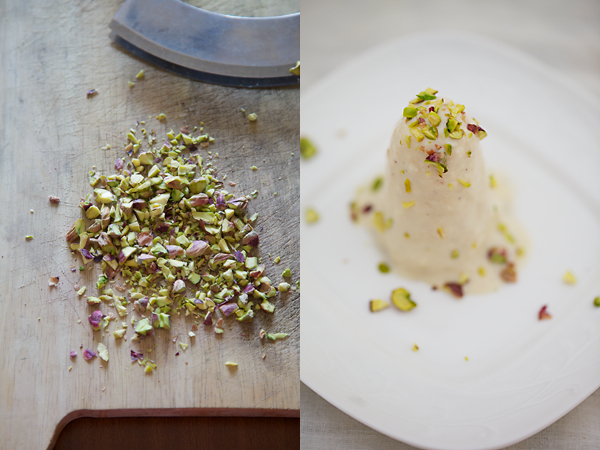 One thing that's a bit funny is – one of my NRI friends who wanted to make kulfi for a party in London used salted pistachios to this As you can imagine, it took a lot of whatsapp messages for me to figure out what was wrong. Thank you for the story and the recipe. This recipe is so good that I do not wish to try any other. Kids love home made ice cream and keep on asking for more. Dalia- Thank you for the feedback! Very happy to hear this! Thank you Anushruti for this awesome recipe. I made it as a surprise for my husband today and he ate 3 one after the other. He called it the best kulfi as well as the best dessert he has ever had in his life. High praise indeed from a person who doesn’t even like sweets much. It made me so so happy to see him go back to the fridge for second and third helpings, i had to stop him after that else he would have had more, lol. Thank you so so much, the video was very helpful. You are welcome Poornima! Its amazing to know that this recipe brought happiness to you and your family.